OpenEMM is the first open source application for e-mail marketing. Its code base has been developed since 1999 and is used (as part of the commercial ASP product E-Marketing Manager) by companies like IBM, Siemens and Deutsche Telekom. OpenEMM offers already more than 95% of the functionality of most commercial products and some features commercial products do not offer right now (i.e. MySQL support). The main difference is, that OpenEMM is an easy to set up single server solution, while its big brother E-Marketing Manager operates on several distributed servers as software on demand (ASP). To provide you with free service & support several selfservice categories are operated on this website such as a FAQ database and support forums. The available content is continuously enhanced by feedback from the OpenEMM user community! Pretty cool ASCII art of various body parts, people and gestures. Quick and easy way to launch the Windows Components Wizard. You could either run the following command from the Start / Run line or create a shortcut. This will launch the Windows Components Wizard so you don't have to go the traditional route through Control Panel / Add/Remove Programs. where is the data value of the Display Value Name, or the Std Value Name ,at HKEY_LOCAL_MACHINE\Software\Microsoft\Windows NT\Current Version\Time Zones\. NOTE: You do NOT encapsulate the time zone string in quote (") marks. NcFTP offers many ease-of-use and performance enhancements over the stock ftp client, and runs on a wide variety of UNIX platforms as well as operating systems such Microsoft Windows and Apple Mac OS X.
Bmail is a free but lean command line SMTP mail sender. Don't get fooled into playing $$$ for huge executables. Bmail allows the user to automate the sending of email messages containing log files, data downloads or error messages on Win32 based computers. Together with the freeware utility mpack, you can also send MIME encoded attachments. Easy way to setup fast, simple and reliable email relay server which will work with ISPs smtp server. Make sure rich text editing is turned on in the Gmail message you are composing and Insert images is enabled. If you see a Rich formatting » link above your message's text editor, click it. See below for turning on image insertion. Position the text cursor where you want the image to appear. Click the Insert Image button in the message's formatting toolbar. Images you have uploaded from your computer remain available in the Insert Image dialog while you compose the message (but not for other emails). After insertion, you can resize and move images easily. Locate the image on the web site or open it directly in your browser. Select View Image from the menu. Hit Ctrl-A (Windows, Linux) or Command-A to highlight the image. Hit Ctrl-C (Windows, Linux) or Command-C.
Make sure rich text editing is turned on in the Gmail message you are composing. If you can see a Rich formatting » link above the editing area, click it. Position the cursor in the Gmail message where you want the image to appear. Hit Ctrl-V (Windows, Linux) or Command-V.
Now click the Link button in the rich-text formatting toolbar. Copy and paste the image's page address at the free image hosting service under To what URL should this link go?. If you uploaded the image to ImageShack, for example, you could link to http://img.imageshack.us/my.php?image=example.jpg. If inserting an inline image does not work in your browser, try in Mozilla Firefox. Submit your blog url to Google at: Add your URL to Google. A better idea is to add a Google sitemap to your blog. Go to Adding Google sitemap to your blog to learn how. Generally it is not necessary to submit your url to search engines nowadays as eventually the search engine will crawl your blog. There is no harm in submitting though. A faster way to do it is to get a link from websites that are already indexed by the search engines as they will automatically follow the links to crawl sites that are linked there. If you don't know anybody who can link you, you can submit your website to blog directories. An easy one to submit to will be My Blog Directory (it is already indexed). Just go to the bottom of the directory and click "Add your blog". (You may want to read more about how My Blog Directory may help you get some extra traffic to your site. Go to "How to make a blog directory for your blog". Other blog directories you can submit to are Blogwise, BlogCatalogue, Bloggernity, BlogFlux, GlobeOfBlogs. You may also "claim" your blog at Technorati. View logical log filename and physical location (current DB only). View DB log size and space used. Here is a quick and easy way to take an RSS feed from a friend or a news site and post it on your blogger.com blog. 2) Enter your email to subsribe to the feed. 3) Setup your blog to update blog via Email. Go to Settings ---> Email & Mobile --> Email Posting Address (Also known as Mail2Blogger). 4) Forward the mails from feedmyinbox.com to this email. Note: You may want to save the blog post as draft when updating via email. Here are a few Windows command line tricks that might make your life easier. schtasks /create /tn "Defrag C" /tr "defrag c: /f" /sc daily /st 02:00:00 /ru "System"
This way you can create a shortcut for short scripts without creating batch files. e.g. a shortcut for stopping and starting the print spooler. %windir%\System32\cmd.exe /c "net.exe stop Spooler && net start Spooler"
No sleep command in Windows 2000/XP (AFAIK) unless you have the Resource Kit, and then you have to move extra files around with your scripts. Simply use the ping command to wait predefined times. In this example it’s 10 seconds. Windows answer to grep. Not as powerful but still useful. e.g. In conjunction with systeminfo above to find out the Virtual Memory on the PC. 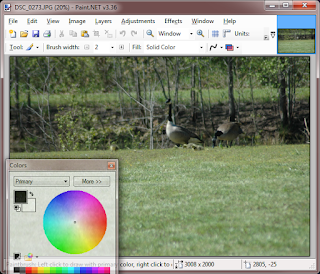 Paint.NET: a free image editor - who needs PhotoShop? For most people PhotoShop is overkill. It's powerful, but complicated. It takes a long time to open. It costs a lot. And most people only use a very small number of Photoshop's features, anyway. Paint.NET is my image editor of choice. It allows you to create, edit and manipulate images. It is a free program, only a 1.5MB download, and it is fantastic. Paint.NET requires the Microsoft .NET framework (which you probably have already installed). The information in this post will benefit anyone looking to understand how to use Notepad++ extended search mode and regular expressions. Notepad++ is an excellent text editor and replacement to Microsoft's notepad.exe. Since the release of version 4.9, the Notepad++ Find and Replace commands have been updated. It now has a new Extended search mode that allows you to search for tabs(\t), newline(\r\n), and a character by its value (\o, \x, \b, \d, \t, \n, \r and \\). Unfortunately, the Notepad++ documentation is lacking in its description of these new capabilities. These slides by Anjesh Tuladhar on regular expressions in Notepad++ is very useful. One of the major disadvantages of using regular expressions in Notepad++ was that it did not handle the newline character well — especially in Replace. Now, we can use Extended search mode to make up for this shortcoming. Together, Extended and Regular Expression search modes give you the power to search, replace and reorder your text in ways that were not previously possible in Notepad++. In the Find (Ctrl+F) and Replace (Ctrl+H) dialogs, the three available search modes are specified in the bottom left corner. Select your desired search mode. Example 1: For this example let's remove all lines that begin with a certain character, for example the exclamation point. Open the Search & Replace dialog box (Ctrl+H) and select the Regular Expression search mode. Press Replace All. All the error messages are gone. [!] finds the exclamation character.
.* selects the rest of the line. Example 2: Remove all blank lines. Switch to Extended search mode in the Replace dialog. Press Replace All and all the blank lines will be removed. \r\n is a newline character (in Windows). \r\n\r\n finds two newline characters (what you get from pressing Enter twice). Example 3: Put each Item on a new line. Switch to Regular Expression search mode. Press Replace All. "Item"s have been placed on new lines. \+ finds the + character.
.* selects the text after the + up until the word "Item". Item finds the string "Item". () allow us to access whatever is inside the parentheses. The first set of parentheses may be accessed with \1 and the second set with \2. \1\r\n\2 will take + and whatever text comes after it, will then add a new line, and place the string "Item" on the new line. Example 4: Delete duplicate or redundant information. Remove all newline characters using Extended search mode, replacing them with a unique string of text that we will use as a signpost for redundant data later in RegEx. Choose a string of text that does not appear in your file — I have chosen RegEx_Example. Press Replace All. All the newline characters are gone. Your entire file is now one very long line of text. Using our RegEx_Example signpost keyword, let's separate the different values. Stay in Extended search mode. Press Replace All. Now, RegEx_Example appears after every comma. Example 5: Put the remaining Items on new lines. Press Replace All. All "Item"s should now be on new lines. Example 6: Get rid of duplicate entries. Press Replace All and all duplicate entries will be removed. A-Z finds all letters of the alphabet in upper case. a-z finds all lower case letters. A-Za-z will find all alphabetic characters. [^...] is the inverse. So, if we put these three together: [^A-Za-z] finds any character except an alphabetic character. Notice that only one of the [^A-Za-z] is in parentheses (). This is recalled by \1 in the Replace with field. The characters outside of the parentheses are discarded. Example 7: Let's get rid of all those RegEx_Examples. Press Replace All. The RegEx_Examples are gone. Example 8: Separate each entry's data from the next. Press Replace All. The final product is a beautiful, comma-delimited file that is ready to be imported into Excel for further analysis. What environment variables are available in Windows? List of the environment variables callable in windows 2000. e.g. Open a cmd prompt and type echo %appdata% which should return the full path to your profile's Application Data directory. If calling from a batch file remember to quote the %variable% e.g. ALLUSERSPROFILE %ALLUSERSPROFILE% Local returns the location of the All Users Profile. APPDATA %APPDATA% Local returns the location where applications store data by default. CD %CD% Local returns the current directory string. CMDCMDLINE %CMDCMDLINE% Local returns the exact command line used to start the current cmd.exe. CMDEXTVERSION %CMDEXTVERSION% System returns the version number of the current Command Processor Extensions. COMPUTERNAME %COMPUTERNAME% System returns the name of the computer. COMSPEC %COMSPEC% System returns the exact path to the command shell executable. DATE %DATE% System returns the current date. This variable uses the same format as the date /t command. Cmd.exe generates this variable. For more information about the date command, see the Date command. ERRORLEVEL %ERRORLEVEL% System returns the error code of the most recently used command. A non-0 value usually indicates an error. HOMEDRIVE %HOMEDRIVE% System returns which local workstation drive letter is connected to the user's home directory. This variable is set based on the value of the home directory. The user's home directory is specified in Local Users and Groups. HOMEPATH %HOMEPATH% System returns the full path of the user's home directory. This variable is set based on the value of the home directory. The user's home directory is specified in Local Users and Groups. HOMESHARE %HOMESHARE% System returns the network path to the user's shared home directory. This variable is set based on the value of the home directory. The user's home directory is specified in Local Users and Groups. LOGONSERVER %LOGONSERVER% Local returns the name of the domain controller that validated the current logon session. NUMBER_OF_PROCESSORS %NUMBER_OF_PROCESSORS% System specifies the number of processors installed on the computer. OS %OS% System returns the OS name. Windows XP and Windows 2000 display the OS as Windows_NT. PATH %PATH% System specifies the search path for executable files. PATHEXT %PATHEXT% System returns a list of the file extensions that the OS considers to be executable. PROCESSOR_ARCHITECTURE %PROCESSOR_ARCHITECTURE% System returns the processor's chip architecture. Values: x86, IA64. PROCESSOR_IDENTIFIER %PROCESSOR_IDENTIFIER% System returns a description of the processor. PROCESSOR_LEVEL %PROCESSOR_LEVEL% System returns the model number of the computer's processor. PROCESSOR_REVISION %PROCESSOR_REVISION% System returns the revision number of the processor. Program Files %PROGRAMFILES% returns the location of the default install directory for applications. PROMPT %PROMPT% Local returns the command-prompt settings for the current interpreter. Cmd.exe generates this variable. RANDOM %RANDOM% System returns a random decimal number between 0 and 32767. Cmd.exe generates this variable. SYSTEMDRIVE %SYSTEMDRIVE% System returns the drive containing the Windows root directory (i.e., the system root). SYSTEMROOT %SYSTEMROOT% System returns the location of the Windows root directory. TEMP %TEMP% System and User return the default temporary directories for applications that are available to users who are currently logged on. Some applications require TEMP and others require TMP. TMP %TMP% System and User return the default temporary directories for applications that are available to users who are currently logged on. Some applications require TEMP and others require TMP. TIME %TIME% System returns the current time. This variable uses the same format as the time /t command. Cmd.exe generates this variable. For more information about the time command, see the Time command. USERDOMAIN %USERDOMAIN% Local returns the name of the domain that contains the user's account. USERNAME %USERNAME% Local returns the name of the user currently logged on. USERPROFILE %USERPROFILE% Local returns the location of the profile for the current user. How do I change MTU size under Linux? You need support in both network hardware and card in order to use JumboFrames. If you want to transfer large amounts of data at gigabit speeds, increasing the default MTU size can provide significant performance gains. Note this will only work if supported by both the network nterface card and the network components such as switch. Press Replace All. All the blank lines are gone. * \r\n is a newline character (in Windows). * \r\n\r\n finds two newline characters (what you get from pressing Enter twice). This tutorial will help you turn your Windows based system into a SecureFTP server. Secure Shell (SSH) is a program that lets you log into another computer over a network, to execute commands in a remote machine, and to move files from one machine to another. It provides strong authentication and secure communications over insecure channels. When using ssh, the entire login session, including transmission of password, is encrypted and therefore is very secure. You may have noticed that many webhosts allow ssh access. This means that you can login to their webserver and execute many UNIX commands (the ones they allow you access to) on your account. Not only can you connect to other computers that provide SSH access, but you can also allow others to connect to your computer using SSH. To take this one step further, you can also turn your Windows PC into a Secure FTP (SFTP) server. SFTP is a program that uses SSH to transfer files. Unlike standard FTP, it encrypts both commands and data, preventing passwords and sensitive information from being transmitted in clear text over the Internet. It is similar to FTP, but because it uses a different protocol, you must use a FTP client that supports SFTP (more about that later). Most UNIX based systems (Linux and OSX) come with SSH preinstalled, so connecting to a remote host is very easy. However, if you run a Windows system, you need to download some additional software to make the SSH programs available to you. Fortunately a free open-source project called SSHWindows, provides a nice Windows installer that will setup the SSH client and Server on your system. Your first step will be to download the Binary Installer Release from SSHWindows. Once downloaded, run the installer and be sure to install both the client and server components. Your first configuration step is to set up the passwd file. You will need to set up the passwd file before any logins can take place. Passwd creation is relatively easy and can be done using two programs that are included with SSHWindows – mkgroup and mkpasswd. Both of these programs are located in the c:\program files\openssh\bin directory. To begin creating the group and passwd files, open a command prompt window and navigate to the c:\program files\openssh directory. NOTE: the username specified above must be an existing windows login account. In the passwd file, you will notice that the user’s home directory is set as /home/username, with username being the name of the account. In the default install, the /home directory is set to the default profile directory for all users. This is usually c:\documents and settings. If you want to change this location you will need to edit the passwd file. The passwd file is in plain text and can be edited in Notepad or any text editor. The last two entries for each user are safe to edit by hand. The second to last entry (/home/username) can be replaced with any other directory to act as that user’s home directory. It’s worth noting that when you run SSH on windows, you are actually running SSH in a scaled down version of cygwin, which is a Unix emulator for Windows. So, if you will be placing the user somewhere outside the default directory for their Windows profile, you will need to use the cygdrive notation. To connect to your new SFTP server, you will need to download an FTP client that supports SFTP. I use Filezilla which is a nice free FTP and SFTP client. You might also try WinSCP which is another free SFTP client. To test if your server is running, create a new connection in your client and specify SFTP as the server type, 22 as the port, and localhost or 127.0.0.1 as the server name. You will also need to provide the user account and password for any account that you added to your passwd file. Now connect to the server. If all went well, you should see a directory listing where you pointed the home folder to. If not, there are a couple of things to check. Make sure your Windows firewall is set to allow traffic over port 22 and finally double check your passwd file to make sure that the account you added is actually there. Because SSH allows access to only Windows user accounts, you can restrict access based upon NTFS file permissions. As such, SFTP does not provide for chroot jails (a Unix method for locking a user to his/her home directory). Simply lock down your filesystem for that user, and SFTP will respect that. In the end, setting up an SFTP server turned out to be a very effortless task. With a couple of open source programs and a couple of command-line commands, you can up and running in no time at all! It is importand to check for ports that are open and there are not needed. Or, you are not limited to netstat or lsof but you can always use a port scanner, telnet or nc to list open/close ports. To copy your PuTTY sessions from one Windows computer or profile to another do the following. To import settings to Windows Vista copy file to a folder of your choice on Vista PC. Right click putty.reg file and select merge. You will be warned by Vista regarding changes. Allow the changes and your setting will get merged/imported into Vista registry. The IBM User Group SHARE celebrates its 50th year of existence in 2005. The SHARE user group holds its first meeting at the Rand Corporation on August 15, 1955 in Santa Monica, Calif. The first meeting is called to help scientific users grapple with the problems of IBM’s first major commercial mainframe, the 704. You can now send SMS messages to mobile phones in most international countries for free through the Jaxtr website. Type the text along with the phone number and hit Send. For the test run, it took less than 5 seconds for the SMS to reach my phone. Message recipients can reply to your txt message using their own cell phones or through a web link that’s included in the SMS message. SMS messaging via Jaxtr is completely free and is independent of the cellular service provider. Other than US and UK, Jaxtr lets you send SMS text messages to mobile phones located in lot of other countries like India, Singapore, Australia, Pakistan, Canada and lot of African nations. Going forward, the text messages sent through Jaxtr may include a line of advertisement. With Microsoft Outlook 2007, you can easily send (or receive) SMS text messages from computer to any mobile phone - just write a new SMS text message (like the way you compose emails in Outlook) and hit Send. Similarly, you can also forward emails, pending tasks and calendar items from Outlook to your mobile phone via SMS. How to send SMS text messages from computer using Outlook 2007 ? To SMS enable your copy of Microsoft Outlook 2007, first register your mobile phone number at SMSOfficer. This new service from Microsoft supports almost all cellular operators in US and other international countries including India. You will soon get an SMS verification code on your mobile phone, confirm and the SMS feature is activated in your Outlook without you having to download any additional software - you will need to click on a configuration link which sets the entire configuration for you. To compose an SMS message in Outlook, select New -> Text Message. Outlook is automatically set up to use the standard text message limit of 160 characters. If your message exceeds the 160 character limit, the extra characters are truncated and delivered as a separate text message. There are no registration charges and you also get 10 SMS credits for free at the time of joining SMS Officer. Once you exhaust the free limit, you need to pay for using the Outlook SMS service - payment can be made via PayPal. When the other person replies to your SMS message, it will arrive in your mobile phone. Am not sure if you can use Outlook 2007 to send bulk SMS messages - i.e., one SMS message addressed to multiple recipeints.